Fall officially started on Friday and PraisetheLord, right? I haven't started decorating for fall yet. Isn't that kind of blasphemous? Usually I've got all the prints on the walls and the pumpkins on the end-tables by Labor Day. It's still been in the 80s and 90s most days so I just don't "feel" it. This weekend, it finally dipped into the 50s/60s, which I realize isn't usual. It's only the end of September. But I'm so much more of a fall and winter person these days. I don't thrive in the summer. Getting out my fall decorations...which I did at least dig out of the shed on Saturday...means that I can reflect back on falls gone by and I can even see some of the fun gifts I've gotten from past Pumpkin Swaps. It's such a reminder of genuine connection and friendship that's been ALL facilitated through blogging. I even bought my pumpkin Scentsy warmer from a blogger! Bloggers, Instagramers, and Twitterers are welcome. If you don't have a blog, that's okay. You can share on other forms of social media! 2. By Monday, October 9th, you will get an e-mail from me or from Becky with your swap partner. 3. Once you know your partner, please make contact within 48 hours (by Wednesday, October 11th) to get to know a bit more about each other. 4. Spend $15-$20 (excluding shipping) to put together a fun fall-themed package for your partner. 5. Mail your package on or before Tuesday, October 24th. 6. Link up with us on Tuesday, November 7th to share your swap goodies! You can link up your blog post and/or share on Instagram or Twitter. 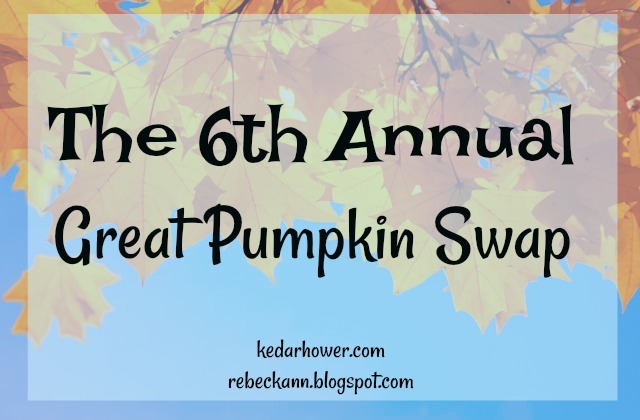 Use #GreatPumpkinSwap and tag @rebeckann2 and @kedarhower! Let me know if something doesn't work or if you have questions! We're thrilled to set this up again! Oh I'm in!! I miss the good old days of blog swaps. Thank you ladies for hosting again this year! I'm in! Missed it last year but on board this year!! So glad you guys are hosting this again! I always look forward to it.